In 1993 the three existing Rotary Clubs in Columbia, Downtown, Northwest, and South decided that the moment was propitious to form a fourth club. The process was started by existing members proposing members for the new club. On May 5 the first meeting of potential new members was held at Columbia’s Jack’s Gourmet Restaurant. Approximately forty people, representing a wide number of classifications, gathered to learn about Rotary International. They were joined by District Governor James Prewitt, Columbia Downtown President Jim Roller, Northwest President Larry McCoig, South President Glen Erhardt, Northwest Directors Kathi Posch, Tom Smith, and Downtown Director Tim Donovan. Each of these active Rotarians shared their experiences with the organization. Tim, Jim, Kathi, and Glen became our mentors throughout the next few months as the new club was created. Our second meeting marked the adoption of a formal name: The Rotary Club of Columbia-Metro, Missouri. A nine-member board of directors was elected, one of whom, John John, is still with the club. 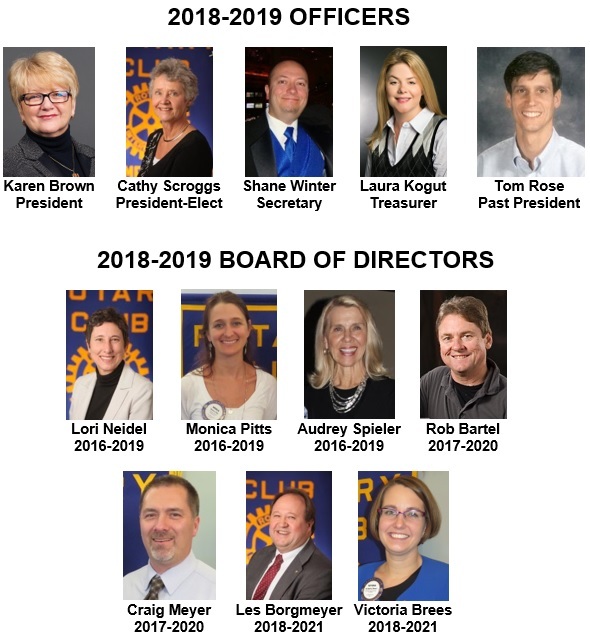 From that board of directors the Club’s first officers were elected: James Shinn, president; Magie Roberts, vice president; Vicki Dunscombe, secretary; B. J. Hunter, treasurer; and Barbara Hodges, Sergeant at Arms. Our next few meetings were devoted to learning more about Rotary International, organizing committees, and completing the charter process. The three sponsoring clubs presented our lapel pins, badge box, flags and stands, club banner, and bell. Our BIG DAY was on June 10, 1993, when we were chartered and admitted to Rotary International as the Rotary Club of Columbia-Metro, Missouri, U.S.A. Admitted were thirty-four charter members–fourteen women and twenty men. Two decades later, five of these charter members were still active in Metro: Win Burggraaff, John John, Ginny Northcutt, Audrey Spieler, and Jim Stock. On the evening of July 21, 1993, our charter was officially presented by Past District Governor James Prewitt at the Charter Night Banquet held at the University of Missouri Alumni Center. Sixty-four members, spouses and honored guests attended. District Governor Bob Hastings offered remarks and installed our officers. It was a rousing start! Club Documents: Like any successful Rotary Club, Metro has modified its policies and procedures in a timely manner to keep pace with today’s ever-changing world. Metro’s Bylaws were last revised in September, 2012. To view this document, please click here. To view the most recent Metro Strategic Plan approved in December, 2015, please click here. To view the most recent Metro Member Orientation and Mentoring Program document approved in November 2016 click here.